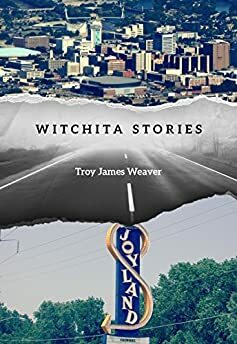 Largehearted Boy: Book Notes - Troy James Weaver "Witchita Stories"
Book Notes - Troy James Weaver "Witchita Stories"
Troy James Weaver's Witchita Stories innovatively blends flash fiction and memoir into a memorable book about one man's Midwestern youth. "There are moments, reading Witchita Stories, where everything dropped away, and I was speechless, or at least whatever the equivalent of speechless is when you're not talking in the first place. There is a deep sadness to these stories, and humor, but most importantly, honesty. This feels real and heavy and it’s just about the best thing I’ve read in a long time." Witchita Stories is a fictional account of my life up until a certain age, or, in other words, it is a fictional nonfiction account of my life until an uncertain age. Take it from me, it doesn't matter much one way or the other, though the lists of favorite musicians and albums and songs are more on the non-fiction side of things—and one of the most important subjects in those lists has to be Tori Amos. This song brings up so much I-dunno-what-it-is-but-I-love-it in me, but something, anything—it doesn't really matter what it is. It's just an emotional thing with no connectors in the reality I believe I inhabit, and yet, the connections are real on a level beyond my experience. My obsession with the complexities surrounding suicide probably started with Kurt Cobain and concluded, through multiple personal experiences, with one of the those just-okay movies about Joy Division. In my opinion "Disorder" is a song that extends beyond most listens into a place of real habitability for me, like wearing somebody else's skin and feeling comfortable in it. Disorder is not only a song, it is a feeling that spreads through my chest almost daily. Beauty and darkness and truth, that's all there, but there is also a great amount of naiveté in Ian Curtis's despair. I find it heartbreaking and beautiful and daily relevant to most things human. While Loveless is perhaps one of my all-time favorite albums, this early song by My Bloody Valentine is a pitch-perfect pop song. I listened to this song a lot while writing about my fucked-up, drug-addled brother—those were the passages, if they sing at all, only do so because of this song. Anything by Burzum is obviously a contentious choice. Picking a song by a racist, convicted murderer isn't usually the best choice to make. But this song, it's on some kind of other plain of existence. It's so dark and brutal, yet beautiful and harmonic in a very dissonant way. It's a pop song played through feedback and yelping screams, propelled from a dark heart. Feels like a knife to the chest of decency—and that's exactly what it was meant to be. On the other side of all that, Varg Vikernes is just a nerd who played too much D&D and, one night, decided to take that fantasy a step further. While writing Witchita Stories I was also at work on Visions. While going between the two, sometimes I felt like I, in a very esoteric way, understood what that meant, the act of killing, and what it represented to those people who murder—what it even felt like. I didn't like it, that feeling, not at all, and I hope I never experience that darkness again. Digging through the crates of insanity for inspiration or footwork for a project is one thing. Letting all those feelings seep into and take over your life, that's horrible. Be careful, writers. Stay sane. Tim Hecker's Ravedeath 1972, the full album, was the thing I listened to most while writing Witchita Stories. I find in it all the things listed in the songs above, plus or minus a dozen more. This album works on you like an irritation, then a virus, and before you know it, you don't even know what it means to be alive. And it no longer matter. Wichita is a place of sparseness. Not much to do around here. Though I will say this, it is a place that is rich in culture, especially DIY music and its growth and movement through the early 2000's. It was a special time around here, with tons of killer people doing killer things. The saddest part of all this is that they went undiscovered due to where they lived, where they came from, the undeniable stilt of personhood and scene this town seems to cultivate. I'm just going to list a handful of my favorite songs from this time, all from here, probably still around here, some still active and some long gone. And Academy's "Love and Hurt, Aids"
Information Welfare's "Live at R Coffee House"